A few years ago, I waylaid a Standardbred filly who was on her way to slaughter. Her name was Stamp the Stars. 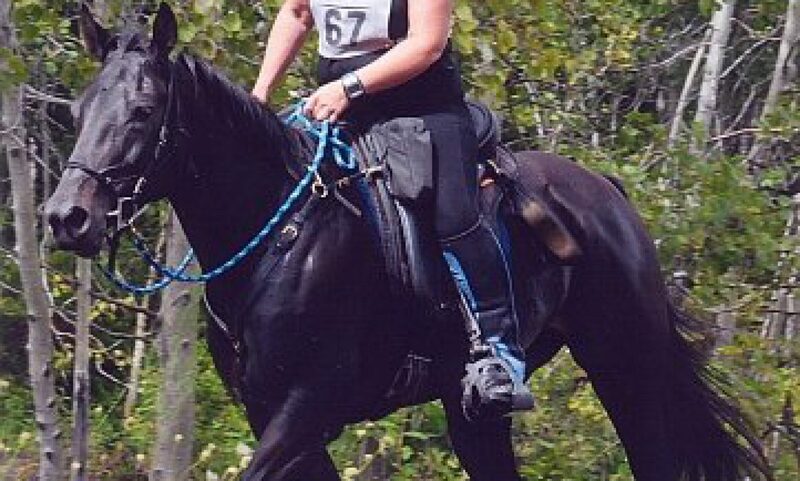 She is pretty much the only one of my Standardbreds who truly was a rescue. Most of them are actually from owners and/or trainers who really like their horses and are trying to assure them good homes after racing. I heard about this filly from the guy who was trailering her. She’d never raced. Never even trained down to anything close to qualifying speed. She’d been standing in a stall at a training centre, without any real care. The other tenants had been feeding her, but no one was cleaning her stall and her feet hadn’t been done in months. She hadn’t been out of the stall for a long time. Her owner/trainer had taken a dislike to her. And she to him apparently. She started peeing on him when he was driving her on the track (not as uncommon as you might think – fillies have ways of getting even). She was said to be sound, but really I had no idea. I bought her sight unseen, and had her delivered here. She came off the trailer at my place and my heart sank. She was dirty, and underweight, with badly overgrown feet. At three years old, she was still rather gawky anyway. Gawky, underweight Standardbreds are not at their best – it takes them a while to grow into their heads. She looked kind of stifle-y. And stocked up. Her mane and tail were matted and tangled, and she smelled bad. I did my best to get her cleaned up. Had her feet done. Wormed her. Got some food into her and eventually got her turned out on the pasture with the rest of the herd. A friend came to visit one day, and met the gawky filly (though she was definitely less gawky by then). It actually didn’t occur to me for even a second that she might like the filly (if it had, I certainly would have sung the filly’s praises a bit more!). But a couple of days later I had an email from her. She’d come up with a plan that would allow her to take the filly and still keep her darling old mare who was no longer rideable. Barb named her “Roxanne”. The filly turned out to have, as Barb puts it “a colourful personality”. They had an occasionally rocky beginning, with Roxanne trying to convince Barb that she should run the show. But with the help of a good coach, they worked through that. Roxanne is a natural boss mare. But she’s also a kind, friendly, and very smart horse. She’s become a good citizen, albeit still interesting. She loves Barb. And Barb loves her. That last bit is an understatement. Barb bubbles over with enthusiasm about her princess. As you can see from her photos, Roxanne grew up, filled out, and glows with good health. She has her own herd of minis to dominate. Life is good. So… the cute little Swamp Dog apparently likes to eat watches. I did NOT know about this little quirk. Today, when I went to put on my Garmin Forerunner 205 GPS watch, I found it covered in teeth marks. One of which had fractured the screen. It’s quite quite dead. I rode Dressy without it today, and copied down Misha’s data from her Polar GPS, which I entered manually into GarminConnect. I upload everything to GarminConnect, and use that as my training log. After riding I went out and bought a new GPS watch. This one is a Garmin Forerunner 305, which comes with a heart rate monitor. Since my old Polar equine HRM met with disaster at Spring Ride, I’m going to try to modify this HRM to work on the horses. Spoke to my aunt a few minutes ago and told her about the GPS-eating dog… “Oh!” she says “Is she still doing that?” Turns out that Swamp Dog has a history of watch-eating. She ate a number of my great aunt Pat’s watches (primarily the bands) and Pat finally started making bands out of duct tape. Very fashionable I’m sure… shabby chic even. I had a new vet in today to look at King. Doc Watt was going to come this week to test his selenium levels, but of course, that wasn’t possible. I called in a vet that I’ve used in the past, Dr. Potter. He’s very calm and takes his time, which is nice. He had a really good look at King. Checked him over, watched him trot, listened to our tale of woe, etc. King has actually seemed a bit worse over the last couple of weeks, not better. So I’ve been worried. Dr. Potter is going to run a full blood panel, check the selenium, and also do a thyroid test. He has some other ideas for things to check out if the blood work doesn’t show anything. So at least I feel like we are doing something anyway. I’ve started riding Dressy. I’ll take her to the training ride next week and do the 15 mile set speed ride. Then to Seoul’s Corners and we can do the 25 miles there. I guess I’m going to have to sort out booting issues for her too. Ares had another session of lunging today. This time with the saddle on. He was very good, but I could see that he was a little weirded out by the feel of the saddle. He was a bit more inverted, and his gait got a little choppy as a result. But after a few minutes he gradually relaxed and dropped his head some. As soon as that head comes down, he smooths right out. After we were done, I brought him back in the barn and got up on a stool beside him. Flapped around the saddle, rested my arm across him, flopped the stirrups around, pushed and pulled sideways, etc. He was watching me pretty carefully, but he stood like a rock. He really is a nice little soul once he gets over thinking that I’m prepping him for my next meal. I’ve put up a video of Ares from yesterday’s lunging session. As you can see, he’s rushing a little bit. But he is a nice mover. Fast and flowing. He settled down after a few minutes and was very responsive to my voice. Dr. Ralph Watt’s funeral procession was rather lovely. Have a look at this video clip of the horse-drawn carriage, piper, and two Toronto Mounted Police officers. I’ve been a little concerned about Ares and whether he might be difficult to work with. He’s a little on the worried, timid side, and I’m used to my big brash horses (I do tend to pick that sort of horse for myself… high, wide, and handsome). Ares is a cautious horse. Very shy with strangers. So I’ve put off working with him for a few weeks to let him settle in. Tonight I cleaned him up and tacked him up in a surcingle and bridle and took him out to teach him to lunge. He was obviously a bit panicky at first, and very rushy (as an aside, he burst into a quite credible canter several times – which bodes well for his ability to canter under saddle). He was very worried about what I was asking for. But does he ever respond well to praise and encouragement. Tell him he’s a good boy and you can see him settle instantly. I managed to get him settled enough to put side reins on him (albeit quite loosely). And took this little short video clip of him trotting. He went from panic to pro (well okay, not quite “pro”, but pretty good anyway!) in about 10 minutes. I am feeling much more confident in this boy after this session. I think he’s going to make a very nice, and extremely responsive horse for the right person. I put the measuring stick on him and he’s just barely 15hh. So he’s not a big horse. Though he moves quite big as most Standardbreds do. He looked pretty smooth to me, though it’s hard to tell just watching. Here is a photo of Doc Watt with Phoenix (Garock) taken in 1999. Phoenix was Di Regendanz’s lovely old Arab gelding. He and Di competed in many OCTRA competitive trail rides and were extremely successful. Phoenix passed away a few years ago at the age of 31. Doc Watt’s funeral was today. He was 81. He was Phoenix’s vet for most of the horse’s life (27 years). King was quite forward today. As in snort-brained, bratty, want to gallop wildly forward. Sigh. He’s an all or nothing kind of horse. I guess the good news is that unlike the old days, I actually DO have brakes now. He will stop when I demand it. But what I don’t seem to have is nice steady speed control when he’s like this. I ask for trot and get maybe six steps and then he starts wanting to canter. I can keep him down to a trot, but it requires focus and constant reminders. If I let him canter, he has little rushes of energy that I have to check instantly or we go into maximum overdrive. You would think that with all the miles of trail this horse has, he’d be over that sort of giddy behaviour. King needs to have his selenium tested again. But sadly my vet died last week. So I am going to have to find a new vet to take over monitoring this. And the other vets that I know of around here are really quite expensive. I am presenting at the training ride on Aug 20. So I will have to see if Dr. Kivi will be there. She can probably pull blood while he’s there, since I’m taking him to mentor beginners on the trail loop after the talks are over. Vegas is Reno’s big brother (by Pleasant Tap). He’s a big goof, and has taken a long time to mature. He’s raced a couple of times before, but never seemed to figure out what his job was. So although he didn’t win this race, everyone was very very happy with him. He placed a good strong third. Brooke’s doctor has cleared her to ride. Sure wish I had that sort of power of miraculous regeneration. If I’d broken that many bones, I’d still be lying there in the hospital sprouting tubes. Sixteen year old bones are still plastic I guess! She says she’ll be out in a couple of days to ride Dressy. The mare is going to be completely blissed out to have her adoring girl back.